Research indicates that prolonged sitting is detrimental to your health. So if you sit at a desk for eight hours every day, you’re at risk for a variety of health concerns. Along with back pain and other assorted ailments, one study found your chance of developing cancer increased by more than 60 percent if you sit for long periods of time. 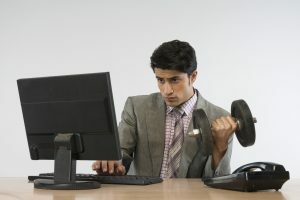 So can you do anything to alleviate a your sedentary work life? How about some deskercises? These exercises you can do at your desk will keep you moving but subtle enough not to be a distraction to your coworkers. With your hands on your desk, walk your legs backward so your body is at a 45 degree angle. Do 12 push-ups. These exercises will increase your arm strength. Get a heavy book and hold it behind your head. Lift the book above your head and return it back behind your neck. Repeat several times to increase your triceps’ strength. Stand 6 inches in front of you chair. Lower yourself down until your bottom hits the edge of you chair and raise back up. Repeat. These exercises will tone your glutes. Stand against a wall and squat to a 90-degree angle. Then raise yourself back up and repeat. Your quads will thank you for these exercises. Stand with your feet together and rise up to raise your calves. Hold for a 10-second count and repeat. You’ll notice a difference in the tone of your calf muscles. Sit in a chair and straighten your leg. Hold it for 10 seconds, then lower it almost to the floor. Hold it there for a few seconds and repeat with the other leg. These will tone your abs. Use the back of a chair to help you balance if necessary. Use a headset when talking on the phone so you can walk and talk. You’ll be able to rack up the steps without even realizing it. The physicians at our Jacksonville orthopedic practice are committed to helping you stay healthy and active. Please get in touch with us if you need more guidance about keeping your body in tip-top shape.